Barclay returns following his recent ‘Promise Falls’ trilogy with a mystery novel that will make the reader question reality alongside his protagonist, the academic Paul Davis. Like the eponymous noise downstairs (from the mysterious typewriter), little is as it seems. 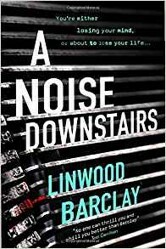 Barclay’s work grows more mysterious with each novel, and A Noise Downstairs is decidedly strange. When college academic Paul Davis, spots a fellow colleague Kenneth Hoffman driving with a broken tail-light; he follows in order to tell him. Hoffman pulls into a deserted yard and behaves strangely when confronted by Davis. The latter discovers two dead women in the trunk of Hoffman's car. He was clearly trying to hide the bodies. A struggle ensues between the two academics which results in Paul receiving a serious head injury. Hoffman's luck worsens and a passing patrol car stops and he is caught (literally red-handed) and subsequently incarcerated, whilst Paul ends up in hospital. Following his release, Paul battles Post-Traumatic-Stress-Disorder that is a result of the events from that fateful evening; one that haunts his dreams. In an effort to exorcize the memories and nightmares that plague him, Paul with agreement from his therapist Anna White, decides to research the background to the serial killer Kenneth Hoffman. Paul’s wife, the estate agent Charlotte even buys him an antique manual typewriter to help him in this task (to free his mind from the demons that haunt him), committing them to paper. Paul has a son from his previous marriage who comes to visit, but this time the sleep over leads to a dispute as Paul accuses his son of using the typewriter at night, which Josh vociferously denies. Paul is convinced he heard the keys tap downstairs, but now he worries that he is losing his mind as he experiences gaps in his memory. In an attempt to patch up the dispute with Josh, visiting the ice-cream van that appears; though Paul notices that the ice-cream man might be Hoffman’s son, or is his mind playing tricks on him again? Like all of Barclay’s work, it’s the characters that make the mystery come alive for the reader, for woven into the fabric of the narrative we have the background to Paul’s ex-wife and her new partner, we have Kenneth Hoffman’s family, the machinations of Anna’s life with her elderly father – which all striate the narrative and make for a compelling reading experience. You cannot trust all you see or in this case hear, for the narrative strands soon converge to shock the reader, propelling toward an unexpected dénouement, one that makes you think deeply. Hugely recommended, as it is a fast read, a very fast read. As an aside, it was interesting to read Stephen King’s last novel The Outsider for thriller writer Harlan Coben ‘appears’ as a character in that excursion into The Weird. While Barclay’s A Noise Downstairs appears to be cut from a similar vine, complete with its own quotient of The Weird. But sometimes what appears as ‘paranormal’ has an explanation[s], and at other times perhaps it does not.